Celtic Astrology was created by the Druids sometime around 1000 BC. The Druid religion was based on 3 basic strands of belief: the first was to remember their ancestors and the past; the second was to have an understanding of nature so that they could work with it, not against it; and the third was to explore the connection of everyday reality with that of the spiritual realm. 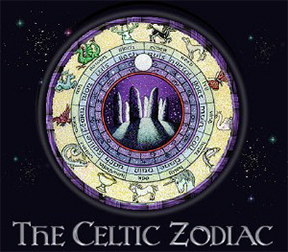 It is especially interesting to compare the Celtic moon cycles with the traditional zodiac sun cycle. Celtic traditions were oral legends and history passed down through the generations, and because there is no written record of the intimate beliefs of the Celts, there is no way to positively determine whether or not they practiced astrology fervently. What is known, however, is that the Celtic priests - druids - divided the calendar into thirteen months based on the lunar cycle. That lunar cycle was frequently associated with different species of trees sacred to the Celts because their concept of the universe was an image of a gigantic tree with its roots bound in the earth and its branches stretching to the heavens. Tree spirits, called dryads, were said to have distinct personalities and to inhabit each species of tree, and each lunar month became associated with a specific type of tree and therefore with different personality traits. Today, that connection to trees is believed to be the basis of Celtic astrology. The Druids religion drew primarily upon both natural and supernatural energies. Spirits who lived in ancient trees held these energies and the tree themselves were considered living. The Druids believed that humans descended from the trees and each tree type held mysterious and magical traits. These traits were encoded in the alphabet called Ogham (also referred to as the Celtic Tree Alphabet). It was this alphabet that Robert Graves, an English poet, novelist and scholar, used as a basis for Celtic Astrology. There are two variations of Celtic Astrology. One that chooses 13 months and gives you a reading based upon your date of birth falli8ng in one of those months. The other version is far more granular and can been seen below. Celtic astrology is much more divided than the Western zodiac, breaking down into 31 sections, each represented by a type of tree. 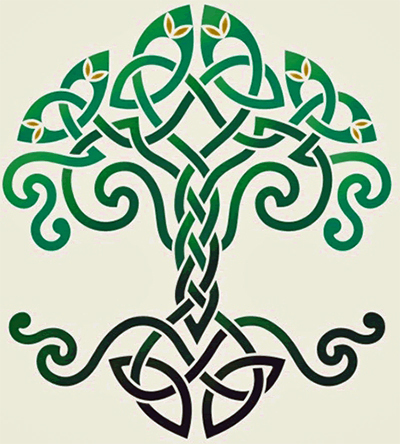 There are 21 different trees represented in Celtic astrology, with some being used twice. Each tree is believed to have basic characteristics, which is said to be found in people based on their birth date. The Apple is the tree of love. People born under this sign are attractive, flirtatious, sensitive, love to love and be loved, faithful and yet carefree. The Ash is the tree of ambition. People born under this sign are lively, intelligent, talented, ambitious and trustworthy, but dislike being criticised. The Beech Tree is the tree of creativity. People born under this sign are economical, materialistic, reasonable and good leaders. The Birch is the tree of inspiration. People born under this sign are friendly, modest, elegant and full of imagination. The Cedar is the tree of confidence. People born under this sign are outgoing, self-confident, determined and sometimes impatient. The Chestnut is the tree of honesty. People born under this sign are bubbly and diplomatic, but may lack self-confidence and feel misunderstood. The Cypress is the tree of faithfulness. People born under this sign are passionate, faithful and optimistic, but sometimes quick tempered. The Elm is the tree of the noble-minded. People born under this sign are cheerful, honest, generous and have a good sense of humor. The Fig is the tree of sensibility. People born under this sign are independent, social and practical, but may be a bit lazy. The Fir is the tree of the mysterious. People born under this sign are sophisticated and ambitious and reliable, yet moody. The Hazelnut is the tree of the extraordinary. People born under this sign are understanding, popular, honest and at times, moody. The Hornbeam is the tree of good taste. People born under this sign have good taste, are disciplined and reasonable, but is often unsure of their decisions. The Lime is the tree of doubt. People born under this sign are talented, loyal, and dislike fighting and stress. The Maple is the tree of independence. People born under this sign are imaginative, reserved, ambitious and like to impress people. The Oak is the tree of the brave. People born under this sign are courageous, independent, sensible and strong. The Olive is the tree of wisdom. People born under this sign are kind, balanced, tolerant, cheerful and calm. The Pine is the tree of the particular. People born under this sign are robust, active and good companions, but often give up easily. The Poplar is the tree of uncertainty. People born under this sign are choosy, philosophic, artistic, but may be lonely and lacking in self-confidence. The Rowan is the tree of sensitivity. People born under this sign are charming, gifted, artistic and passionate, but are often emotional. The Walnut is the tree of passion. People born under this sign are noble, ambitious, admired and passionate, but often inflexible. The Weeping Willow is the tree of melancholy. People born under this sign are attractive, empathetic, tasteful, dreamers, but may suffer heartache in love. Celtic astrology is just another means to understanding others and ourselves. Many believe that our birth dates often dictate, at least in part, who we are and having an understanding of the traits associated with a particular date helps us learn better how to deal with our moods and those of others.